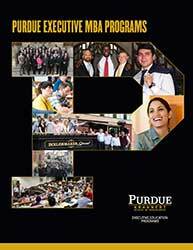 We have created a Tool Kit that will aid you in gaining financial and logistical support from your company for your Purdue EMBA program. Start using your Tool Kit today! Companies often review requests for educational support on a case-by-case basis, so it is important to articulate to your management how the degree will mutually benefit you and, more importantly, the company. Retention of a valued employee, leading to more responsible developmental assignments and advancement. Suggest ways to make financial support palatable. Consider all combinations of financial support and time off, such as use of current and banked vacation, paid and unpaid time off and, if applicable, employee training days (a standard benefit in some companies). Several alumni reported foregone bonuses and foregone salary increases in amounts up to the full cost of tuition. If full tuition is not forthcoming, ask about partial tuition reimbursement and coverage for non-tuition expenses. Suggest signing a retention agreement, specifying the time you promise to stay with your company after graduation, and the penalties for leaving early. Typically, these agreements are two years in duration. This is common practice for employees receiving company support.